Where can I find the latest version of the CTXMLS Rules and Regulations? What size picture is needed in the Portal Profile? To ensure the picture fills up the entire area, the picture should be 500 x 500 pixels. How do I adjust the Street View? 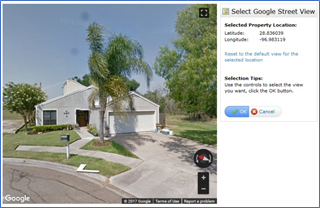 Once your property is mapped correctly, you can also set the street view. To adjust the street view, click on the Choose Google Street View located underneath the map picture. A new window will appear and will allow you to adjust the street view for your property. You can move your picture up, down, left, right, zoom in, and zoom out. When you have your property positioned correctly, click on OK.
What is a partial listing and how would I use it in Matrix? A partial listing in Matrix is actually called an Incomplete listing. Whenever you enter a new listing, it is recommended that you save your listing as Incomplete so that you are able to add pictures and supporting documents. Once you have uploaded all of your pictures and supporting documents, you can access your listing again to Submit the Listing. It will appear on your home screen under the My Listing Widget. It will be labeled My Incoming Listings (1). Click on the My Incoming Listings link, then click on the MLS number in the single line display. Click on the Edit link at the bottom of the listing sheet. After clicking on the Edit link, Click on the Residential Input Form link to take you back to your listing. Once everything is complete in your listing, you are ready to Submit Your Listing. The second way to access the Incomplete Listing is to go to the Input Tab, select your listing from the dropdown list. Your Listing should have an “I” by it since it is incomplete. After selecting your listing, click on Residential Input Form. Once everything is complete in your listing, you are ready to Submit Your Listing. What if I have another agent in my office that is going to co-list a property with me, who gets credit once it’s closed? When a property is co-listed with an agent in your office, each agent will get credit for 50% of the sale each. What do I do if I would like another agent in my office to cover for me while I’m on a cruise or if I have personal assistant that I would like to work on my behalf? Matrix allows members to set up other subscribers to work on behalf or impersonate another subscriber. To do this, click on My Matrix, Settings, and then Team Settings. Matrix will fill in the Team Members name and you will need to select whether you want them to Impersonate Me or Work on Behalf of Me, then click on Add. Impersonate Another Agent: If you select Have this member Impersonate Me, email messages sent would be sent with your name and email address, not the person impersonating you. In addition, your team member will be able to print reports and those reports will have your name stamped on them as if you printed them. They will also have access to your contacts and saved searches. Working on Behalf of Another Agent: If you select Have this member Work on Behalf of me, email messages sent from Matrix would be sent from your team members name, not yours. Printed reports would indicate they are printed by the team member on behalf of the other agent. They will also have access to your contacts and saved searches. When one of your team members logs in, they can switch from their own individual login to the Team login by clicking on their name in the upper right corner of the screen to open the select popup. What is the photo policy for listings? At least one photo must be submitted to Central Texas MLS at time of entry, regardless of property type and/or status except where the seller expressly directs that the images of the property are not to be submitted to Central Texas MLS. One photo must be a “curbside” view of the property that shows the property upon arrival. Participants and Subscribers may select one photo that will be displayed as the primary photo. For new construction, the exterior elevation or the floor plan is acceptable. For unimproved non-residential properties, a plat or survey of the property is acceptable. Digital images and photo description text should not contain information that brands the listing to a specific agent or office. This includes contact information such as names, phone numbers, email addresses or website addresses, including the use of embedded, overlayed or digitally stamped information. All real estate, builder, developer or property management signs are prohibited from appearing in the photo. Images previously submitted by a Participant may not be used by other Participants on subsequent listings without written permission. What are the property statuses in Matrix and what do they mean? Sub-categories for Active Under Contract include Option Period, Sale of another Property and Application Received. Cancelled: Properties in which the listing contract has been terminated prior to the expiration date. Withdrawn: The listing has been withdrawn from the market, but a contract still exists between the Seller and the listing broker and there is no intention to bring the listing back on the market. All status changes must be reported to the service within two (2) business days. What are the Property Types in CTXMLS and how will Farm and Ranch properties be listed? Property types in CTXMLS include: Residential, Multi-family, Land, Commercial, Residential Lease and Commercial Lease. CTXMLS does NOT have a listing input for Farm and Ranch so users may enter a new listing as a Residential listing or a Land Listing. Land listings do have a category labeled “Property Types” with an option noted as Farm and Ranch. Does the listing expiration date show for all listings? The expiration date only appears on the detail sheet viewed by the listing agent and/or listing broker of that particular property. MLS users are not able to view the expiration date of properties listed by other agents/brokers. What is the difference between DOM and CDOM? DOM or Days on the Market is the number of consecutive days a property has been listed in the MLS by a listing agent. This indicator will change when a listing expires and a different agent lists the property. However, if the listing does expire and then relisted within 90 days of expiration by the same agent, the property will continue to show the previous DOM plus any news days for the current listing. The key here is 90 days. 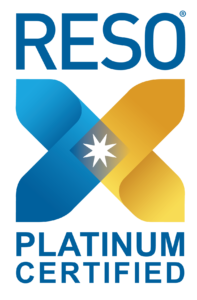 If a property is listed and then terminated by expiration or other means, and the property is not relisted for 90 days or more, the DOM will be reset to “0”. Scenario: Agent lists a property with a 6 month expiration date. In 60 days, your clients asks you to withdraw as they do not want their property to show that is has been on the market for 60 days. You withdraw the listing at the request of your client and relist it the next day. The DOM in this case will be 61 when it is relisted since the property was not off the market for 90 days before relisting. CDOM or Cumulative Days on the Market is the number of consecutive days a property has been listed regardless of listing agent. The CDOM marker goes with the property not the agent. For example, Agent 1 lists the property for 180 days and the listing expires. A new agent, regardless of company, lists the property. In this case, the DOM will be reset to “0” but the CDOM will continue the count at 180 days plus the number of days of the new listing. The number of days shown in the CDOM is only reset to “0” if a property is removed from the market and is not listed again for more than 120 days. How do I set my market area as a search default on my Market Watch and Hot Sheets? Please clicks on the links below for a complete tutorial on how to accomplish this task. For Market Watch, click here. For Hot Sheets, click here. 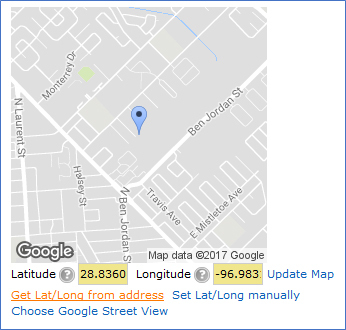 How do I map my property correctly? Mapping your property is a function of the input a new listing routine. 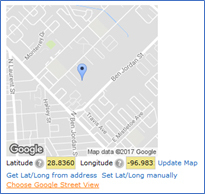 When you are on the Listing Information tab on the Residential Input form, click on the Get Lat/Long from Address link located underneath the map picture. Clicking on this link will position a pin at the location of the property. If the property is still not mapped correctly, you can adjust it by using the Set Lat/Long Manually. Can a listing still be closed if it expires while it is under contract? No. If a listing expires before your listing closes, you will need to get a new listing agreement signed and reenter the listing into the MLS. Agents are given ample notice of expiration and it is the agents responsibility to update the listing prior to expiration. Why is sell my listing not present? In Matrix, the status of “Change to Sold” is only available if your listing is Under Contract. If the status of “Change to Sold” is not available, you will need to change the status to Under Contract before you can use the Change to Sold status change. How do I share a listing on social media. Select your listing and view in an Agent Full display. Select the Share link at the bottom of your screen. 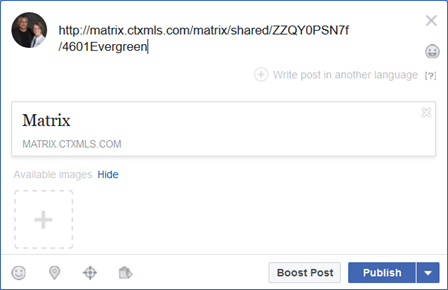 Copy the Share Listing Link by holding down the CTRL-C (Copy Command) or by right-clicking on the link and selecting copy. Log in to your social media business page and paste the link to create your post. What history should be available in Matrix? Matrix tracks price changes and status changes when accessing the History icon. This icon looks like a clock and can be found on single line and full displays. In addition, if you wanted to have an audit trail of everything that has happened to your listing, you can go to Input, select your listing, then click on Show Input Audit under the Other Options heading. How do I do a search for a property with FM in the address? Because it is difficult to control how agents enter addresses, it is best to utilize the * when you perform searches. Did an agent enter FM 236 or did they enter Farm to Market 236. To assist you with this type of search, try the following using the *. By entering the above in your speed bar, you are saying you want all Active properties that ends with 236 regardless of what was entered before the 236. This also means your search results could contain CR 236, FM 236, Farm to Market 236, or TBD CR 236. I’ve tried searching on the speed bar but then I get a new window asking a question. Why do the search results not appear? When Matrix is confused by your entry, it will ask you a question to clarify what your looking for in your search. As an example, if you were to just type Victoria in the speed bar, Matrix will prompt you with Did you mean: City: Victoria, County: Victoria, or Street Name: Victoria? When you receive this type of message, you must click on one of the options so Matrix will know which field to search. Do I still call the board office to add a comp listing? No, you can input closed listings yourself by going to Input, Add New and then select the appropriate SOLD property type and complete the form. Click here for a full list of instructions. Can you give me a tip for searching using the speed bar? As you conduct more searches, you will begin to understand the correct ways to enter information into the speed bar. How can I request an IDX or data feed for my website? Currently, if you would like to have a data feed to your website, please complete the Data Feed Request Form to datafeeds@ctxmls.com and request the feed. All data feed requests will be answered within 2 business days. Do I need to be a member of an Association to join the CTXMLS? You only need to belong to one association in Texas to join the CTXMLS. Associations provide member services, the MLS provides real estate data and you can subscribe to as many different MLS systems in TX as you would like. The only requirement is that if you are not a broker, your Broker or DR will need to join prior to you being able to access the system. Is there someone or some place to get help with entering my listing during this free time? You can call your primary association anytime to get assistance. In some cases, the technical support question may be routed to the AnswerLink help desk. Is leasing included in the new CTXMLS? Absolutely, leasing is included with no additional cost. Members of the CTXMLS will be able to receive access to the multiple listing service, leasing, technical support, and training all in one subscription fee! How many agents will be able to see my listings in the new CTXMLS? Currently, there are over 748 agents in the Fort Hood Area, 1992 agents in the Four Rivers Area, 553 agents in the Temple-Belton Area, 454 agents in the Williamson County Area, and 272 agents in the Victoria Area. How do I search homes with pools or other specific features? 1. While in the search screen, look for the Add link located at the bottom left of the screen. This link is underneath where you click on Results to see listings. Click on the Add link. 2. Clicking on the Add link will provide you with a list of fields available in Matrix. Locate the Exterior Features field by navigating up or down in the list of fields. Once you have found Exterior Features, you can double-click on the field or you can click on the Add -> button to move the field name to the Selected Field box as shown below. 3. Once you have added the Exterior Features field to the Selected Fields box, click on the Back button to return to your search screen. 4. Once you have returned to your search screen, you will notice that the Exterior Features field is available at the bottom of your screen. 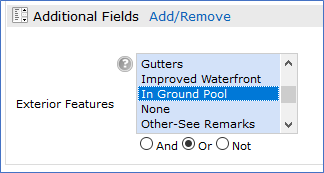 If you are wanting a home that has an In Ground Pool, simply select In Ground Pool from the Exterior Features field as part of your search critera. The cost to join the Central Texas MLS is established by each of the member associations. Please contact your primary association to determine the cost associated with joining the Central Texas MLS. What is the Central Texas MLS (CTXMLS)? The Central Texas MLS is the first Regional Shareholder Multiple Listing Service covering Bell, Caldwell, Comal, Coryell, DeWitt, Goliad, Gonzales, Guadalupe, Hays, Lampasas, Lavaca, Refugio, Victoria and Williamson Counties. It is important to remember this is an additional benefit for our members and does not need to replace any other MLS membership. Rather, it gives you, our members, an opportunity of subscribing to either the CTXML, staying with your current vendor, joining multiple MLS systems or subscribing to any MLS you wish to join. The benefit to our members is the freedom to participate in the MLS or MLSs’ that will give their clients the greatest exposure of their listings. Copyright © 2019 CTXMLS. All rights reserved.